Ten-year-old Milton Hastings, Jr. knew that moving to Smithville wouldn't be better like his Mother said. After all, Milton was used to moving, seeing as how his Father, Sergeant Hastings, a war hero who died the previous year, was always being transferred thanks to the military, taking his family with him. This time Milton and his Mother were living above Mr. Dugan's antique bookstore, where Milton's Mother worked, and Milton was attending a private school with rich kids. Sure it seemed nice enough, but in reality, it wasn't. Milton didn't really mind the not having any friends part. After all, sure it would have been nice to have someone to talk to, but it wasn't essential. What really bothered Milton was the fact that he was picked on non-stop at school. So when Milton meets up with Duffy McDoogle, a magical gnome, and is able to get back at his tormentor's, he scoops up the opportunity. But maybe getting revenge wasn't the right thing to do after all. 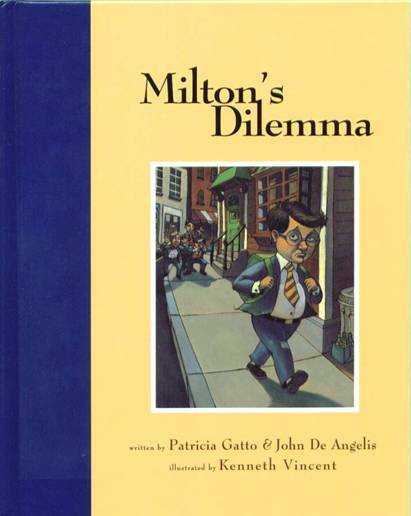 MILTON'S DILEMMA is a fantastic book that will teach school-age children from kindergarten to sixth grade that bullying and revenge is unnecessary, and unkind. Milton is a character whom many children will identify with, as are his tormentors, Ralphie, Jimmy, and Tommy. Patricia Gatto and John De Angelis, have put into words what most children experience everyday. While this will help children, this is also a fantastic book for parents to read as well, so as to see what their children may be going through, as well as to open up a floor for discussion about bullying, and the repercussions it carries along with it. Join Milton through his quest for friendship, self-acceptance, and consequences, as you will not be disappointed.